This past weekend we took a long weekend to Carcassonne, France. 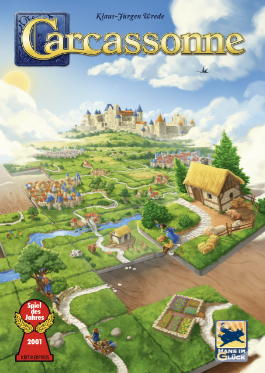 Yes, Carcassonne like the game. Carcassonne consists of two main areas. La Cité, the medieval walled city/castle, is a UNESCO World Heritage site. Our hotel was inside the city walls. While we were in Southern France, we thought we would take advantage of our proximity to Andorra and pay a visit. On the way to Andorra we stopped in Camon, a cute little town, to take some pictures and eat our picnic lunch. Andorra primarily consists of skiing, spas, duty free shopping, and mountains. If you like those things, then I would recommend it. If not, well…at least you can add an Andorra shaped magnet to your collection. Oh, by the way, Andorra uses a different kind of plug. Randy was excited. We did a wine tour with Vin en Vacances. We visited two vineyards in the the Corbières AOC. The first winery, Château Ollieux Romanis, was the bigger of the two. Here we tried 3 wines, a white and two reds. The owner, Pierre (yes that was really his name), showed us around and told us about how he makes wine. After the first winery we stopped for an amazing lunch in Lagrasse, one of France’s “most beautiful towns”. I wish we had had more time to explore the town, because it was very pretty. We were told that during the 60s it was run down and cheap so the hippies moved in. Now it has old hippies. And tasty food. The second winery, Château St Jean de la Gineste, was much smaller and run by a woman all by herself! Here we tried five wines, a rose and 4 reds. On the way home we stopped at a honey shop and a goat cheese farm to sample their wares. Goats are funny. At the goat cheese farm we saw some lined-up caterpillars, called les Chenilles Processionnaires. They are crazy and rather poisonous, so don’t eat or touch them.